Good morning! I have a card to share today using Visible Image stamps. I am so excited about this card. I was playing around with submission cards for a magazine call and was getting extremely frustrated with my embossing powder not working (come to find out - embossing powders DO have an expiration date!) 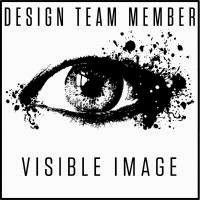 So, I decided to set that aside for the moment and work on my Visible Image weekly inspiration card instead. That's when I created this card and I was so happy with it - first try and everything! I created a bit of a background by wetting my watercolor paper and adding some color with distress inks. Then I added the splotches by touching my paper directly to the ink on my craft sheet. 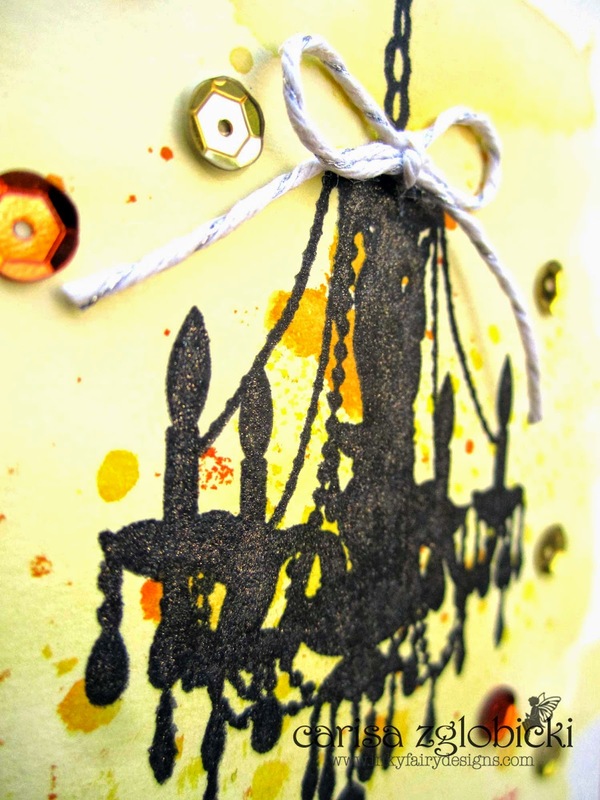 After it was dried, I stamped the chandelier from the Visible Image Chandalier Set over the watercolor in VersaFine Onyx Black ink. Easy Peasy! Yes…you know I did, I took out my Black Wink of Stella Glitter pen and added it to my stamped image. You could have used clear, but I there were some bits that I wanted to cover more so I used black and it turned out beautifully - I really wish I could photograph it better so you could see the shimmer!! I matted my watercolor panel on Authentique Patern Paper from the Radiant collection. This went so well with the yellows and oranges. It still needed a little something so a touch of twine and some sequins were the perfect embellishment. 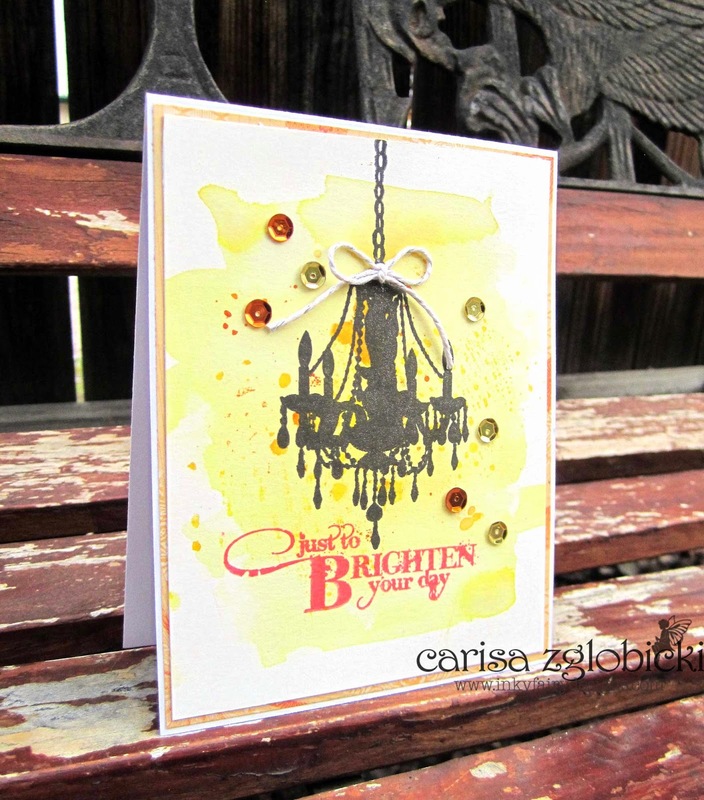 I love that this stamp set has 4 different sentiments that go with this stunning silhouette chandelier image. I will be back later this afternoon with 3 more cards I created using the other sentiments in the same style along with a video showing how quick an easy these cards are to put together. I think this is a great set to create a collection of notecards to give as gifts -- and with the holidays coming up, having some handmade gifts ready to go is a good thing! Thank you for stopping by - I hope you enjoyed my card - be sure to stop by later today when my video has posted! Be sure to check out our Get Spooky Challenge this month for your chance to WIN £20 to spend on our stamps!